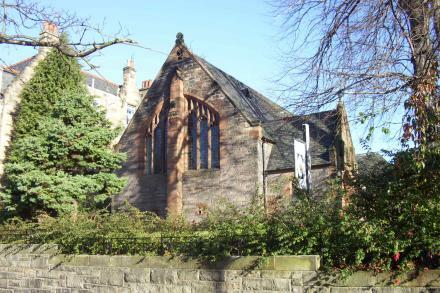 This morning Jane and I attended the farewell service of The Revd Canon Tim Morris, from his position as Rector of the Church of the Good Shepherd, Murrayfield, Edinburgh. He’s retiring from The Scottish Episcopal Church and heading over to The Anglican Church of Canada for a year or two … for an adventure in mission. As we walked up the beautifully tarmacked path towards the church building I couldn’t believe that it was nearly two and a half years since my own leaving service there. It doesn’t feel that long ago. Doesn’t time fly when you’re having fun! At the door we were warmed greeted by Tim with a bear hug each. Tim was resplendent in his white cassock alb, green stole and bright red Kickers shoes. That was the first of many reunions. Some names I remembered immediately, some took a while to be conjured up, others I had to ask for; but I recognised every face regardless of whether I could put a label to it or not. Amazing and humbling that that one visit, probably over three years ago now, should be recalled with such fondness. A less not to underestimate the simple gifts of presence and listening. And I did remember her, by the way, … just not her name. Or which hospital it was — I visited so many. But I remembered her and was delighted that she was there today. Another face that I remembered, and history. I just couldn’t bring his name to memory quickly enough, so gave in and asked. So lovely to see these people looking so well. It was lovely to be amongst friends and fellow members of the church family. It was especially lovely to catch up with folks from St Salvador’s, the church that I had most involvement with during my three years in Edinburgh. Warm hugs and handshakes, cheeky comments and smiles. The news of our expectant twins was received joyfully, and in good time it would seem as there has been too much sad news of late with the sudden death of one long and faithful member of the congregation (MP) and another struck down with a heart attack (MB). I also got to meet for the first time the minister of Saughtonhall United Reformed Church, the Revd Susan Kirkbride, who arrived in post just after I left — nothing personal! The service was a slightly extended 1982 Scottish Liturgy with a liturgy for the demission of office and prayers inserted between the post-sermon anthem and the offertory. When a priest newly arrives to take up responsibility of leading a congregation there is a special service, during which he receives symbols of that office: keys to the church building, chalice and patten (cup and plate for communion), congregational role (impressively now held on an USB drive!) and deed of institution (the paperwork!). Today’s service was very similar, but in reverse with Tim handing these symbols back: a letting go. It was very poignant and meaningful, concluding with Tim completely stepping out of his cassock alb (the white vestment) and retiring to sit amongst the congregation, next to his wife Irene, to allow the rest of the service to be conducted by the remaining members of the ministry team. Tim’s last task before being stripped of the elements of his office was to preach. The readings were Isaiah 61:1-3, 1 Corinthians 2:1-5 and Mark 8:34-38, although he didn’t stick to these. Instead he asked for forgiveness for anything left undone or unnoticed, and encouraged us to keep on pressing onwards. You’ll remember, friends, that when I first came to you to let you in on God’s master stroke, I didn’t try to impress you with polished speeches and the latest philosophy. I deliberately kept it plain and simple: first Jesus and who he is; then Jesus and what he did — Jesus crucified. which made it clear that your life of faith is a response to God’s power, not to some fancy mental or emotional footwork by me or anyone else. That’s exactly how I felt when I arrived at the Church of the Good Shepherd and St Salvador’s in 2003. I felt totally inadequate, scared to death at times, embarrassed for the times that I really messed things up (remember that awful sermon about liturgical colours, anyone?) but … I tried to live out the love of Jesus in the way that I conducted myself; and that’s also what I still try to do in my current job. From the kind memories of those few folks I spoke with today I felt affirmed that I had walked something of that path. As I sat in the congregation this morning reflecting on where God has brought Jane and me these last two and half years I realised and remembered two things. I realised that something in me really misses living and worshipping as part of a parish ministry team; that I kind of felt incomplete. It’s real privilege that is incredibly difficult to explain on a blog in just a few sentences, so I won’t even try. But then, at the same time I remembered too that when I was in that situation, in full-time parish ministry, I felt incomplete and frustrated that I wasn’t able to be as creative as I can be in my current job. An affirmation, perhaps, that I’m in exactly the right place; that I am where God wants me to be. And that has to be a good place to be. We all retired from the church building to the hall for drinks, speeches, a few amusing songs from the choir, and the handing over of gifts. 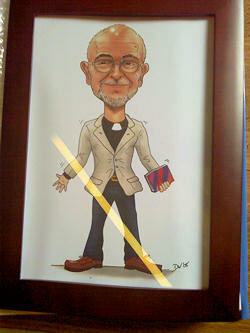 This caricature of Tim was gifted by the other members of the ministry team. Ah … how others see us! And the remaining time in the church garden was spent dodging rain showers, enjoying a BBQ and catching up with folks. All in all a lovely day with friends and family in Christ. If it’s your discipline, please do remember Tim and Irene as they prepare for their long journey to Canada, for their safety and that they will quickly and ably settle into their new life and ministry in Manitoba in the Diocese of Rupert’s Land.